This article is about a pipe that is used for smoking cannabis and other substances. For the preparation of cannabis leaves and flowers, see Bhang. For the ethnic quip used for Bengali Hindus, see Bong (term). For other uses, see Bong (disambiguation). In construction and function a bong is similar to a hookah, except smaller and especially more portable. A bong may be constructed from any air- and water-tight vessel by adding a bowl and stem apparatus (or slide) which guides air downward to below water level whence it bubbles upward ("bubbler") during use. To get fresh air into the bong and harvest the last remaining smoke, a hole known as the "carburetor", "carb", "choke", "bink", "rush", "shotty", "kick hole", or simply "hole", somewhere on the lower part of the bong above water level, is first kept covered during the smoking process, then opened to allow the smoke to be drawn into the respiratory system. On bongs without such a hole, the bowl and stem are removed to allow air from the hole that holds the stem. Bongs have been in use by the Hmong, in Laos and Thailand, and all over Africa for centuries. One of the earliest recorded uses of the word in the West is in the McFarland Thai-English Dictionary, published in 1944, which describes one of the meanings of bong in the Thai language as, "a bamboo waterpipe for smoking kancha, tree, hashish, or the hemp-plant." A January 1971 issue of the Marijuana Review also used the term. The word bong is an adaptation of the Thai word bong or baung (Thai: บ้อง, [bɔ̂ŋ]), which refers to a cylindrical wooden tube, pipe, or container cut from bamboo, and which also refers to the bong used for smoking. A bong made out of a red bell pepper. Excavations of a kurgan in Russia in 2013 revealed that Scythian tribal chiefs used gold bongs 2400 years ago to smoke cannabis and opium. The kurgan was discovered when construction workers were clearing land for the construction of a power line. The use of a water pipe for smoking was introduced in China during the late Ming Dynasty (16th century), along with tobacco, through Persia and the Silk Road. By the Qing Dynasty, it became the most popular method to smoke tobacco, but became less popular since the Republic era. While typically employed by commoners, the water pipe is known to have been preferred by Empress Dowager Cixi over snuff bottles or other methods of intake. According to the Imperial Household Department, she was buried with at least three water pipes; some of her collections can be seen in the Palace Museum. The water pipe itself, a single-piece construct consisting of the bowl-stem, the water container, and a drawtube at least 3 inches, but some can be up to 12 inches in length. Some are straight with a "Joint" (Sandblasted top part of stem, usually about 1 inch long, and all the way around, tapered or cone shaped, so the tapered, or "cone shaped" bowl will fit in)some are bent to resemble a crane. The size of the bowl is similar to that of a one-hitter, typically the width of a thumbnail or smaller. The tobacco container with a lid. A pipe rack small enough to be held by one hand, and consisting of two large holes for the tobacco container and the water pipe. It may have smaller holes to hold various pipe tools. Diagram of a bong in operation. The water can trap some heavier particles and water-soluble molecules, preventing them from entering the smoker's airways. The mechanics of a bong are compared to those of a laboratory gas washing bottle. The user puts their mouth at the top and places the cannabis in the tube, as shown in the picture. Bongs are often either glass or plastic that use a bowl, stem, and water to produce smoke. Most glass bongs are made from heat resistant borosilicate glass, allowing the bong to withstand repeated use and heat exposure without breaking. After the bowl has been packed and water has been inserted into the bong, the substance is lit and the smoke is drawn through water to produce a smoother smoke than other methods of smoking do. To smoke a bong, the smoker must inhale in the bong so bubbles containing smoke begin to come from the stem. Once the bong has a fair amount of smoke built up, either the carb is uncovered or the stem is separated from the bong, allowing the remaining smoke to be inhaled. However, a 2000 NORML-MAPS cannabis study found that "water pipes filter out more psychoactive THC than they do other tars, thereby requiring users to smoke more to reach their desired effect". In the study, smoke from cannabis supplied by the NIDA was drawn through a number of smoking devices and analyzed. This study looked at the tar to cannabinoid ratio in the gas in output by various bongs, as well as unfiltered and filtered joints, and vaporizers. The results showed that only vaporizers produced a better tar to cannabinoid ratio than unfiltered joints, but that within the cannabinoids produced, even vaporizers warped the ratio of THC (the psychoactive component of the smoke) to CBN (capable of producing medical benefits but is not psychoactive) in favor of CBN. This showed an unfiltered joint had the best tar to THC ratio of all, and bongs were actually seriously detrimental in this respect. MAPS also reviewed a study that examined the effects and composition of water-filtered and non-filtered cannabis and tobacco smoke. It found that when alveolar macrophages were exposed to unfiltered smoke, their ability to fight bacteria was reduced, unlike exposure to water-filtered smoke. It also found substantial epidemiological evidence of a lower incidence of carcinoma among tobacco smokers who used water-pipes, as opposed to cigarettes, cigars, and regular pipes. "It appears that water filtration can be effective in removing components from cannabis smoke that are known toxicants... The effectiveness of toxicant removal is related to the smoke's water contact area." Specially designed water pipes, incorporating particulate filters and gas-dispersion frits, would likely be most effective in this regard; the gas-dispersion frit serves to break up the smoke into very fine bubbles, thereby increasing its water-contact area." These frits are commonly referred to as diffuser for the way that they diffuse (or disperse) the smoke as it exits the downstem, and usually consist of small holes or slats at the end of the downstem. This study suggests that a bong's smoke is less harmful than unfiltered smoke. 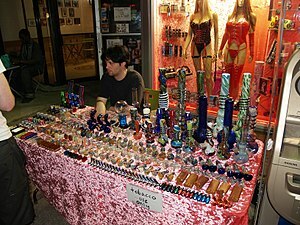 A variety of bongs for sale, among other merchandise in Manhattan. For legal reasons, the products are labeled as "Tobacco Use Only"
In the United States, under the Federal Drug Paraphernalia Statute, which is part of the Controlled Substances Act, it is illegal to sell, transport through the mail, transport across state lines, import, or export drug paraphernalia. In countries where marijuana and hashish are illegal, some retailers specify that bongs are intended for use with tobacco in an attempt to circumvent laws against selling drug paraphernalia. While technically 'bong' does not mean a device used for smoking mainly cannabis, drug-related connotations have been formed with the word itself (partly due to punning with Sanskrit bhangah "hemp"). Thus for fear of the law many head shops will not serve customers who use the word "bong" or "bongs", or any other word typically associated with illegal drug use. Some brand name bong manufacturers (notably RooR) have sought to curb the counterfeit market for their products by suing stores accused of selling fake merchandise. ^ "Contraband: The Sale of Regulated Goods on the Internet". ^ "History of the Bong". ^ "Thai dictionary entry for baawng". ^ Times, Tech (31 May 2015). "Experts Unearth 2,400-Year-Old Solid Gold Bongs In Southern Russia". ^ "Information on Chinese Water pipe from Hudong (chinese)". ^ "Information on Chinese Water pipe from Baidu (chinese)". ^ "Marijuana Consumption: Smoking, Eating, And Drinking Marijuana". Archived from the original on March 23, 2015. Retrieved March 10, 2016. ^ Keliher, Evan (2003). Grandpa's Marijuana Handbook (2nd ed.). Chula Vista, California: Aventine Press. p. 37. ISBN 978-1-59330-135-4. ^ "MAPS/CaNORML vaporizer and waterpipe studies". ^ "DEA Definition of Paraphernalia". ^ "Phoenix New Times: Head Games". ^ Spencer, Terry. "Pipe maker sues: Fake bongs hit world of high-end glass pipes". Thecannabist.co. Retrieved 2017-01-28. Wikimedia Commons has media related to Bongs. Erickson, William V. et al. Water pipe or bong. US Patent 4,216,785.